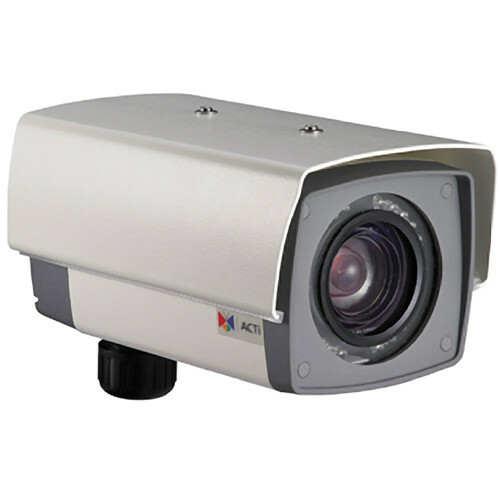 The ACTi KCM-5511 2M Outdoor Box Camera with 22x Zoom Lens is a cutting-edge network video surveillance camera. It can capture, compress, and transmit real-time video in good quality (15 fps, 2 MP, 1920 x 1080). This camera is an ideal choice to build an intelligent IP surveillance system. The powerful 22x zoom lens with ISP-enabled auto focus brings precision video quality not available with manual adjustments. Focus is no longer an issue during installation, saving time while enhancing quality. With the innovative embedded Image Signal Processor (ISP), this camera responds to changing lighting condition with a customized algorithm. This allows for clear image with very little noise at night. This device supports 3 compression formats: H.264, MPEG-4, and MJPEG. It brings superior image quality at 15 frames per second in full HD 1080p (1920 x 1080). In 720p (1280 x 720) and VGA resolution (640 x 480), the device offers 30 frames per second. Advanced WDR technology is the advanced approach of improving the dynamic range of the camera. Advanced WDR is designed to improve the dynamic range while keeping the true colors, sharp edges of objects and free from noise. With a DC iris lens, this camera automatically adjusts incoming light levels to achieve good video performance. Wildly fluctuating outdoor lighting condition is no longer an issue with your video quality. To extend the capabilities of the IP Box Camera series, a powerful surveillance program is included in the package. You can easily use an existing PC as a digital video recorder. Scheduled and manual recording keep every important video recorded in the local hard disk. Reliable and accurate motion detection with instant warning enables immediate response in almost every condition. Quick and simple search and playback function lets you easily find the images and video you want. This IP box camera can be integrated or controlled by applications from third party software developers. Software developers can save considerable efforts by using ACTi’s streaming library or ActiveX control. Box Dimensions (LxWxH) 9.4 x 6.0 x 5.7"